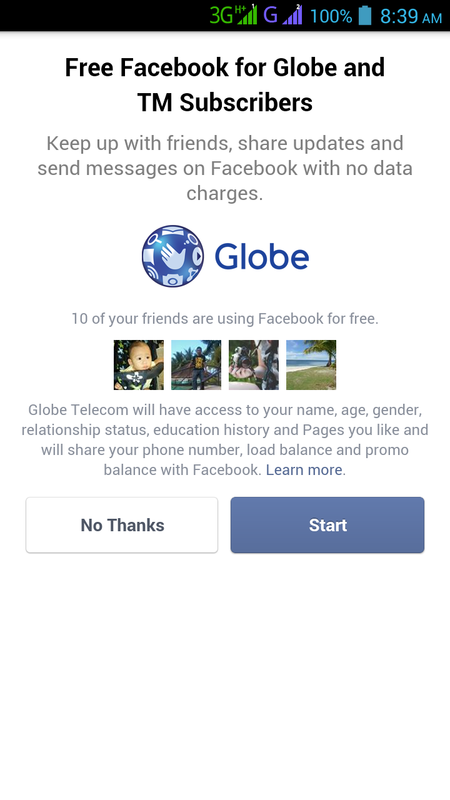 Good news, Globe Telecom just started rolling back their Free FB (Facebook) access to all their prepaid users. After Smart announced that they offer free internet access to all their active subscribers, Globe also answered back a promo that gives your unlimited Facebook browsing with no string attached. If you loved this free service from them before, I’m sure it’s sweeter on this second comeback so prepare all your selfies, quotes, likes and comments as you’ll now getting free FB starting today. Initially, the promo runs until November 30, 2014 and we do hope that Globe will extend it again just like what they did last year. The same drill as before, you can use Facebook app or your default mobile internet browser. You’ll be prompted with a message that you are using the service. Same goes with Touch Mobile users (TM), you can use this free service also. Make sure that you have a good signal reception, and check if 3G/4G is available on your area. To check, you can visit their website or use your phone by setting the network mode to (GSM/WCDMA/LTE) and see if you’ll getting 3G,H, H+ or only E (Edge)or G(GPRS). If you’re getting only E and G, it means that your area for now only support 2G network. If you notice that you’re getting 3G,H and H+ connectivity on your phone but keeps dropping to 2G (E and G type) then trying forcing your device setting to use WCDMA only on network mode. Be aware that this free unlimited is only for Facebook.com domain, so don’t dare to browse Youtube if you don’t want to charge with regular browsing rate. I think it’s better to use the Facebook App than your default web browser in browsing Globe FREE Facebook, feel free to check and give us your thoughts. For settings, use myGlobe Inet APN (http.globe.com.ph) for prepaid users. If you want to configure it manually on your phone, check our post about Globe GPRS and APN settings.